Curse is one of those sites that has changed but really hasn’t changed. It is still one of the premiere WoW addon sites out there. From the main page click on downloads, you’ll see World of Warcraft is right up at the top of the list. 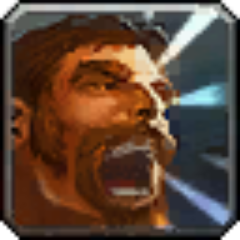 Click on addons and away you go. You can browse among the top downloaded addons, or search for one by class, category or name. Curse also provides a great way to manage those pesky addons. I highly recommend their addon client. It’s very easy and convenient to use. 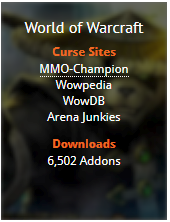 You can become a member for free and download the curse addon client. The client provide one stop shopping for addons and easy peasy updating. If you choose to become a premium member you can update all your addons with one click. All the while supporting the gamers that write the addons you enjoy. I cannot recommend this enough. It is fairly inexpensive and a good way to give back to the community. Curse also offers a couple of additional features besides addons. If you haven’t been to Curse lately go and check it out. Enter a contest, download an addon and enjoy.